I've been on a major citrus kick lately. Last week I made chocolate cake with lemon icing, white cake with lemon icing and when I ran out of icing - plain old lemon cake. 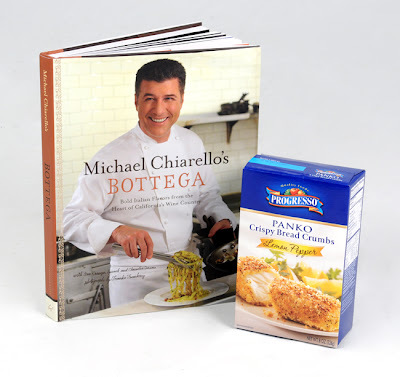 Luckily MyBlogSpark and Progresso teamed up to send me a copy of Bottega: Bold Italian Flavors from the Heart of California's Wine Country (click for promo chapter) and a box of Progresso's Lemon Pepper Panko. Man was that stuff delicious! Yes, I did delete the pictures of the meal I prepared. Why do you ask? They were sooooooooooo good! I love lemon and they had a peppery kick which was so delicious - plus anything baked has less fat so plus one. I am definitely going to buy this in the future - even WITHOUT COUPONS! Contest ends on November 14th because that is my birthday! Also because that is a week from today and a week seems like a fair amount of foody time. To enter suggest something else I can coat in panko with delicious results. I have about half a box left and am not adverse to making more chicken fingers *insert Homer drool* If you are culinarily challenged (I feel your pain Dear Reader) feel free to just wish me a Happy Birthday (woo-hoo I'm gonna be thirty-twoooooooo) and we'll call it even. I saw your entry in my giveaway.. u forgot to mention how you are following my blog... just comment and let me know or else I will have to delete your entry! They would be great on fish. My husband makes "lemon pepper" shrimp by just sprinkling a whole lot of lemon pepper seasoning in the pan when he sautes the shrimp in butter. Maybe this would be a little more "delicate" flavor for that dish? Try Making Turkey Fingers. I use a lot of Turkey instead of chicken and it works great!! It is nice to switch it up a bit!! I might try it with fried pork chops. I've never used panko bfore!! 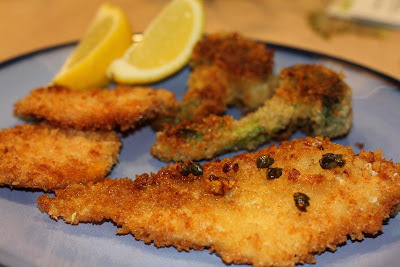 I am all about chicken fingers, but maybe sprinkle as a toppnig on a cassarolle? I suggest you dip big fat onion rings in seasoned buttermilk (buttermilk, flour, salt, paprika, pepper, whatever other spices you like) then in panko and bake it to make wonderful crispy onion rings. Happy Birthday!!!! I've sprinkled panko on mac n cheese before but I'm not sure how that would go with the flavoring? You can coat day old risotto to make baked risotto balls! I too am culinary challenged so Happy Birthday! Although I would have wished you one without it being a requirement! Happy Birthday! I am a new reader to your blog! I love Panko crumbs. I haven't tried the lemon pepper yet but those look delicious. One thing I use the regular Panfo for is that I make Buffalo Chicken Bites---rotisserie chicken mixed with buffalo chicken wing sauce and cheddar cheese, coat them in panko and fry them up. They're so delicious! P.S.- What a great giveaway!